Your Flashing Helps With Drainage, As Well As Leak Defense. 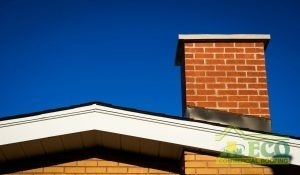 Total service and replacement offerings for your roof flashing represent one of our leading services at [company-name]. Roof flashing defends vulnerable areas such as seams, vents, valleys, and edges, and thus acts as a crucial piece of your roofing. Flashing should additionally direct water toward the rain gutters, and serves as an indispensable piece of your roof drainage system. You can have faith in our peerless team with full-service maintenance if your flashing has commenced to crack or otherwise display wear. A consequence of compromised areas around your roofing system takes place through deteriorated flashing. Since roof leaks harm everything from the insulation, walls, ceiling, and roof, they must get fixed soon. Water becomes channeled toward your flashing through the roof’s drainage structure. Deteriorated flashing directly attracts rain, then leaks it inside your house. Because of this, it becomes doubly critical to service. Contact ECO Commercial Roofing at (833) 200-0571 today for any problems or queries about flashing installation in Texas, Louisiana, and Mississippi. Pay attention to these indicators for flashing maintenance, and do not hesitate to call us to arrange for service. Since deteriorated flashing makes your roofing system exposed, any damages require much more expensive fixes or replacement work over time. Pictured Here In Black, The Roof Flashing Prevents Leaks Around The Seams Where The Chimney Meets The Roof. Older houses usually have roof cement or tar that performs as flashing. These materials can degrade over time and can be discovered and addressed with regular maintenance. Schedule an inspection to reveal whether your flashing has aged beyond the point of usefulness. When we render maintenance or replacements to a house’s flashing defense, we use new, first-rate metal. Metal flashing can also necessitate restoration eventually. It is time for repairs if you can see that your flashing has started to rust. When flashing begins to rust, it means that it is now susceptible to rainfall. Flashing abandoned to rust should eventually break down to the point where it does nothing at all. Should you detect leakage in your house, flawed or wrongly installed flashing serves as a likely cause. 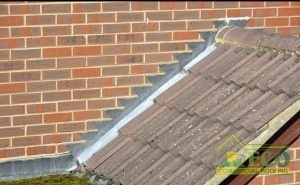 Certain parts of flashing may become especially sensitive to rain thanks to the roofing’s drainage structure. Flashing acts to guard your roofing system from harm, so areas that have begun to leak need to get restored as quickly as possible. For all issues with roof flashing in Texas, Louisiana, and Mississippi, don’t wait to phone our team at (833) 200-0571. Our team will identify trouble areas through a comprehensive check-up, then make the needed service or replacements to update the repair of your flashing. ECO Commercial Roofing serves as the premier source for roof flashing across the nearby community.